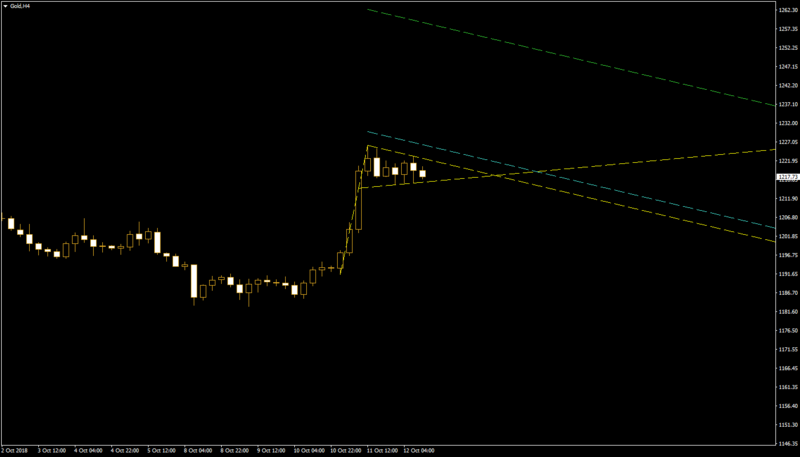 A pennant has formed on the four-hour chart of gold. A pennant is formed as prices consolidate after a period of moving in one direction. It is a continuation pattern, suggesting that prices will move in the previous direction after taking a breather. Considering that on the present chart prices were moving upward, it is a bullish pennant. That means a move further up is likely. On the present chart, yellow lines show the pennant itself. The cyan line is located 10% of the flagpole’s height above the pennant and suggests an entry point for bulls if prices will indeed break to the upside. The green line is at the flagpole’s length above the pattern and offers the target for taking profit. It is important to be cautious in trading, remembering that patterns do not predict performance with 100% certainty as was demonstrated in the previous case of the similar pattern, when an upside breakout was not followed through with a rally to the profit objective. The chart was built using the ChannelPattern script. You can download a MetaTrader 4 chart template for this gold pattern. You can also trade it using the free Chart Pattern Helper EA. If you have any questions or comments regarding this bullish pennant pattern on the chart of gold, please feel free to submit them via the form below.